Each year the British Neuroscience recognises excellence in neuroscience by awarding a range of prizes. 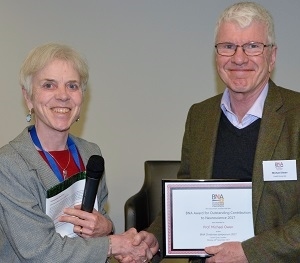 At the BNA's Christmas Symposium, held in London on 18th December, we were delighted to present awards to seven individuals who have all made their mark in the field. Michael is also Head of the Division of Psychological Medicine and Clinical Neuroscience, Director of the MRC Centre for Neuropsychiatric Genetics and Genomics, and Emeritus Director of the Neuroscience and Mental Health Research Institute. Michael has worked on the genetics of psychiatric and neurodegenerative disorders for over 20 years and has extensive research expertise in the genetic aspects of schizophrenia, bipolar disorder, Alzheimer's disease, Attention Deficit Hyperactivity Disorder (ADHD), and Dyslexia. He has published over 500 scientific papers and, working alongside colleagues in Cardiff, has identified novel genetic risk factors for a number of disorders. Michael has previously been President of the International Society of Psychiatric Genetics and a member of the Council of the Academy of Medical Sciences to which he has recently been re-elected. In the 2014 Birthday Honours, Michael was knighted for his services to neuroscience and mental health. 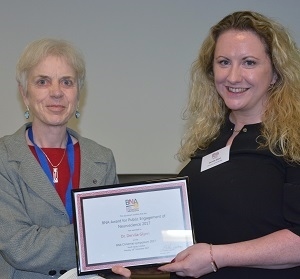 As Neuroscience Coordinator at the University of Cambridge, Dr.Dervila Glynn (right) supports neuroscientists across the institution through activities including development of scientific events (conferences, seminars, public engagement events and workshops); identification of opportunities for interdisciplinary research collaborations and helping to prepare funding proposals. 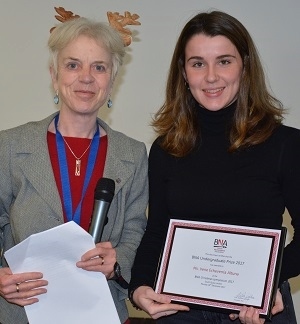 This year’s prize is awarded to Dervila for her extensive contribution in designing, funding and organizing the highly successful BRAINfest event in Cambridge. BRAINFest 2017 was a highly successful interactive, multi-media exhibit which was visited by 3000 members of the public and was highly successful in all respects, including a visitor rating of 4.8/5. Dervila had a hand in virtually every aspect of this huge exhibition, which occupied the entire Cambridge Corn Exchange over three days and evenings, and is highly deserving of this year’s award. Moving from the field of mathematics and statistics, Dr. Gido van de Ven undertook the impressive challenge to shift towards Neuroscience by first completing an MSc at the University of Oxford, for which he was awarded the Sherrington prize for finishing top of his class. 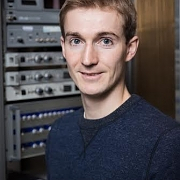 For his thesis, Gido combined large-scale ensemble recordings, optogenetics, anatomy, pharmacology, rodent behaviour and complex data analysis. Most notably, he showed that the offline reactivation of cell assemblies during sharp wave/ripples oscillatory events stabilizes hippocampal representations of space (van de Ven et al, Neuron 2016). Embarked on a second project, Gido aimed to develop an automated scheme to classify hippocampal interneurons from extracellular recordings, showing promising results in a short period of time. The high quality of Gido’s work has been recognized with an impressive list of awards and honours: the prestigious Gotch Memorial prize for his 1st year PhD report, various substantial travel awards, a highly competitive Vice-Chancellor’s Fund grant, twice selected for a talk at an international conference and the award of a 6-month postdoc salary through the MRC DTP supplementary funding scheme. Irene Echeverria Altuna attained a first class BSc degree in Neuroscience from UCL. Her lab project investigated the specificity of a new range of non-paralysing botulinum constructs, designed to silence key neurons in the pain pathways and therefore produce long periods of analgesia. Her results were included in the lab’s presentation at Neuroscience 2016, San Diego and she has been included on a recently submitted paper. Irene was recently awarded the “la Caixa” Fellowship for Postgraduate Studies in Europe, given to 65 students out of 1000 applicants. The fellowship will fund a total of £30,000 towards her Master’s studies, a 2-year Dual Master programme in Brain and Mind Sciences, run at UCL and in Paris. Irene is described as an ‘extremely hard working, intelligent and ambitious young woman, intent on getting a good PhD position and establishing her own laboratory’. The BNA congratulates all this year’s winners for their amazing achievements!